RX7 Import and Miata Performance Parts. Mazda RX7, SR Motorsports.com. We are currently building a project 1993 Mazda RX7 street car. It is our shop car and will be the test mule for many upcoming projects. 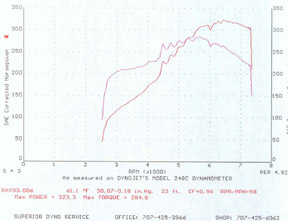 We have designed and built a new SR Medium intercooler that is used in our 1993 Mazda RX7 . It allows the stock battery to be left in its original location . Our fuel system has been upgraded with our SR high flow fuel pump to make sure that our 1993 Mazda RX7 survives all of the abuse we will give it on the street and at the track. Our Ultimate SR aluminum radiator will be in and will be put to the test to make sure that our motor will always run cool. We used our SR Cold Air Intake air box system that pulls in cold dense air from the very front of the car where it is supposed to. The SR stainless steel full 3 inch exhaust system is now installed in our 1993 Mazda RX7 . We have been tuning it with the new A'PEXi Power FC and putting it to the Dynojet, to test it with very good results so far. emissions including a SR High Flow Catalytic Converter and even a smog pump. It has our Level III system installed on it. This includes: our SR Medium intercooler, SR Cold Air Intake air box, SR downpipe , SR catback system, and our SR Tuned A'PEXi Power FC. At only 12 PSI boost, it produced 323 (**corrected ) Horsepower with 284 ft. pounds of torque. © Copyright 2002 SR Motorsports.com. All rights reserved.